I grew up in a small rural community surrounded by trees and gorgeous vistas. 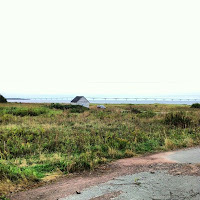 Our house was a 2-minute drive from the the Bay of Fundy, which boasts the highest tides in the world. If I wanted to be alone, I could easily go find a place where no one would be able to find me. Fog drifted in and out like a familiar friend, and the salt scent of bay air met your nose the moment you opened a window. Naturally, moving to a city proved to be a bit of a challenge for me at first. Though not a particularly big city by any means, Moncton still had an unsettling tree-to-person ratio. I had grown accustomed to the quiet solitude that came from walking in the woods or watching the tide roll in. That was something that was now missing for me. Rest area at the Tankville School trail. My first year of university, I would sit in my dorm alone. That part wasn't so bad--but what I didn't like was the sound of ambulance sirens blaring at all hours of the day. Université de Moncton's Lafrance dormitory was where I stayed, and it loomed above the Georges Dumont hospital. During the week I didn't take many opportunities to go anywhere other than my room or class, but on the weekends I would go home and that would give me the chance to go on those long beautiful walks I craved. In the summer, I would also go home to work from May until the end of August, when school would start again. One of the highlights of the apartment we rented just off Elmwood was the little duck pond and walking trail down the road. The wildlife made me feel at home, and seeing people walking their dogs made me even happier. There was a small patch of woods right by the Université de Moncton campus that I used to take a shortcut through, despite the sign that barred pedestrians from passing through. I wasn't the only rule-breaker and often found other students doing the same thing. That one little strip of forest was enough to reconnect me to the place that I wanted to be: the forest. As much as I hate the term, calling me a tree-hugger wouldn't be far from the truth. Five years ago, in October 2008, Brad and I moved to Moncton permanently. I got a job downtown, we got a new apartment and adopted our cat, Lady Pansy. All of a sudden, life was much different for me. Having no specific days off, I found visiting home much more difficult. In addition, Brad and I would often have separate days off. I would get to visit home very rarely and found myself exhausted from being on my feet all day anyway. We weren't anywhere near any kind of walking trail or park. The best we had was the little area in front of the cultural centre across the road. Gradually I found out about various places to go in town. First it was the Irishtown Nature Park just off Elmwood Drive. 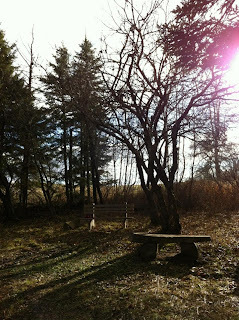 Next was Mapleton Park off the Gorge Road. Both places provided scenic, woodsy walks that put me at ease. We often saw many other people there, but for some reason I didn't mind. Those places are like communities in themselves; many people smile and say hello as they pass, even if you've never met. After walking on those paths for some time, we started to locate smaller, less travelled paths. 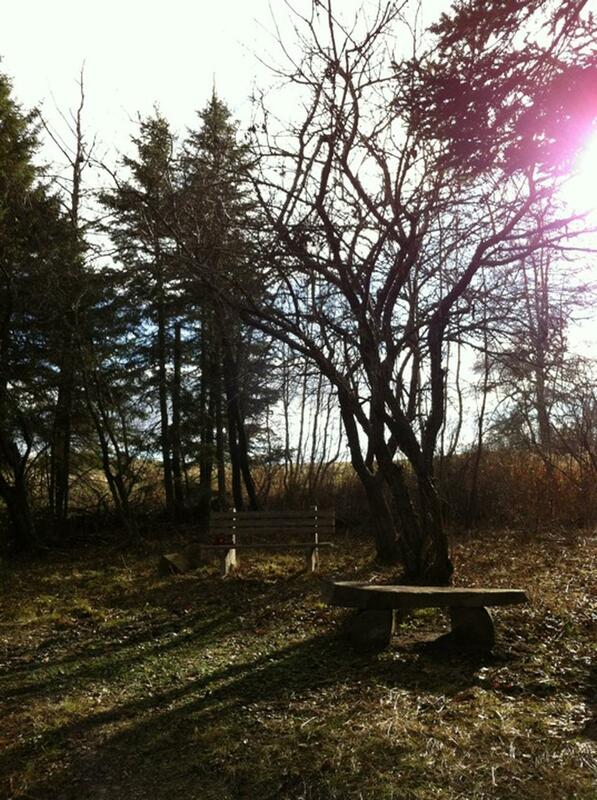 A recurring favourite became the Tankville School trail, just down the road from the Irishtown Nature Park. It seems the Tankville trail hooks onto the back end of another trail, because we found that one, too. The first time, we found it by walking over the frozen lake at Tankville School. The second time, we took the real entrance--just a short drive down the road. Now we've taken to other sorts of adventures, whether it's through Centennial Park or through visiting outlying villages, cities or towns. One thing that can be said for Moncton is that it lives up to its nickname--the Hub City. Moncton is a short drive away from all kinds of interesting places. It's still close enough, too, that I can get down home when I need to reconnect. On Labour Day, for kicks, we took a little drive down to Cape Tormentine for a change of scenery. Definitely a change of scenery. At first, I didn't like the noise and I didn't like the street lights getting in the way of the stars. I still don't like the way the air smells compared to the fresh drifting sea breeze of Alma. Moncton has become home for me in many ways now, though, from the coffee I pick up at Read's on my way to work, to the people I've met simply from working in the mall. 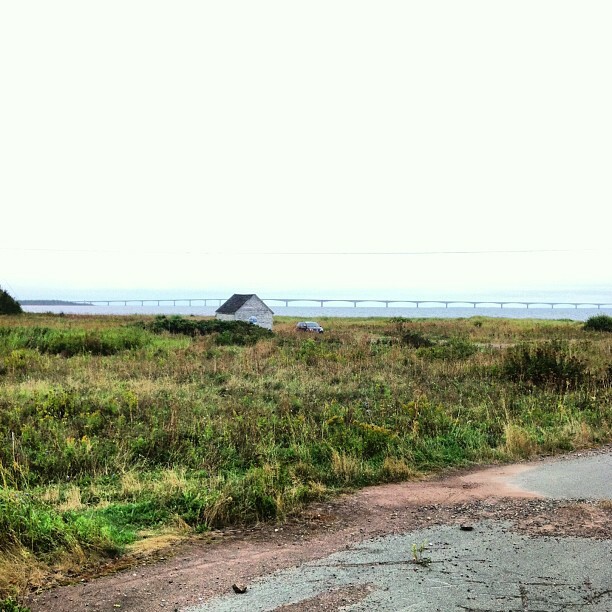 While I still sometimes think I'd prefer living out of the city, right now I'm happy with our life in Moncton. oh, my goodness. i do not know when i started reading your blog, but i am always surprised a little when some blogger i don't know writes about places i have been to. this summer i went to moncton for the first time and i went down to bore park to see the bore in my jammies at something like 10 pm after going to alma to get cooked lobsters and it is very beautiful land where you are. i hope to go back there someday soon. What an incredible coincidence! You posted back when I did the Listserve post, so maybe that was what sent you here. Alma is actually my hometown, so that's even funnier--that was the rural community off the Bay of Fundy that I was talking about. What area are you from? I'm glad you enjoyed yourself here.